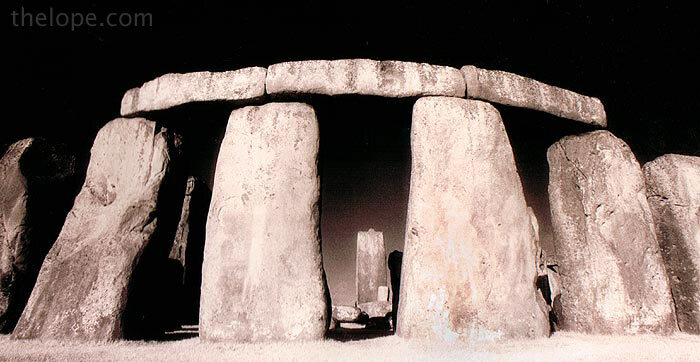 Stonehenge, on Kodak black and white infrared film, from a 1993 trip to the UK. We were there in May, so obviously not at the solstice, which I hear is a madhouse at times. Summer snuck in behind some clouds at 6:26AM today in central Kansas, and we began preparing for our weekend. I'll be shooting photos In Tulsa, OK at Starbase 21's Trek Expo 2006, just as I did last year at Trek Expo 2005. Ace will be going along, as usual, to observe human pop culture. 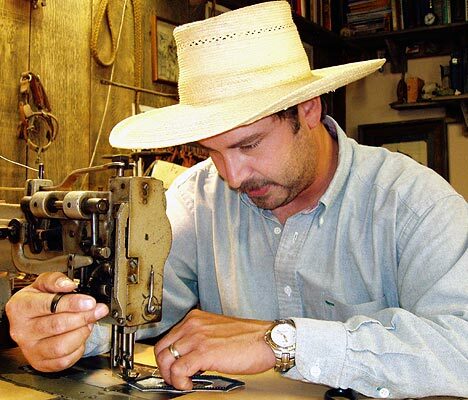 Toward that end, he sought the craftsmanship of Justin Reichert of Reichert's Custom Leather in McPherson, KS, to help make him a new disguise. Reichert whipped out the main component of one of Ace's costumes; with it, he'll be able to blend into the throng of fans and be indistinguishable as he continues his study of the human condition. Can you guess what he'll be dressed as? I've seen Reichert work a few times now, and have always been impressed at the variety of kinds of leather there are in his shop. 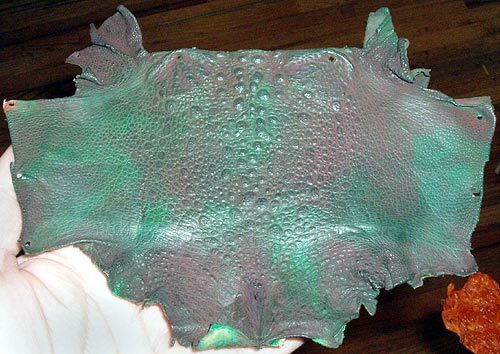 I asked if there were any types of hides that he was particularly looking forward to working with, and he showed me this skin he had just procured of a Cane Toad from Australia. Notice that I didn't write, "Australian Cane Toad." That's because they're South American, not Australian, and therein lies a problem. I had just heard a story on BBC radio the other night on Cane Toads. 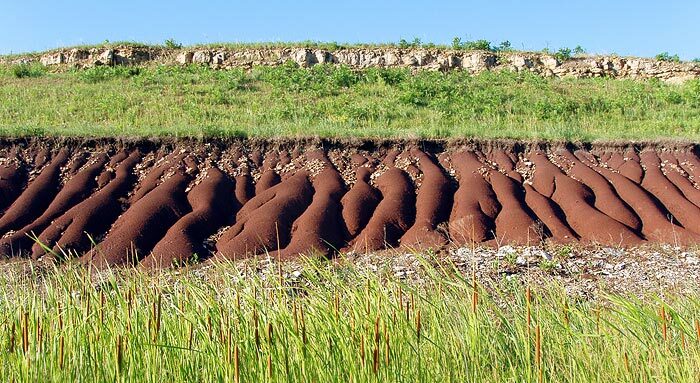 The abbreviated version is that they were introduced to Queensland from South America some 70 years ago in a misguided attempt by the sugarcane industry to control a beetle problem. Well, not for the sugarcane industry, but the toads loved it - so much so that they went forth and multiplied in their new world, protected from their own predators by poisonous backs. It's good poison, too...lethal enough that it's enabled the toads to have a detrimental effect on Australia's native wildlife. Here's a story on them from National Geographic News. In a classic case of bad research, nobody had taken into account that the toads can't jump very high, not nearly high enough to get to the beetles where they live at the top of the cane. By the way, someone accidentally released some Cane Toads in Florida; maybe in a few years Reichert won't have to import their hides. 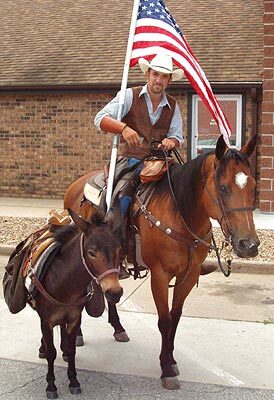 So, I'm leaving the leather place and what do I see but a man on a horse carrying a flag and trailed by a donkey as he moves down Main Street in McPherson. Of course, I yelled to him - something articulate like "I know there's a story here, what's the deal with you?" It turns out he's a bible-toting cowboy. 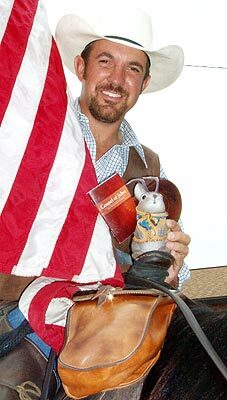 Couy Griffin of Reserve, New Mexico is an ex-member of Buffalo Bill's Wild West Show at Disneyland Paris who is now on a San Francisco to Jerusalem trek to spread the word of his ministry. Ace considered that perhaps he needs his own quadruped. There's some pretty big-time golf coming to Prairie Dunes Country Club in Hutchinson, KS. 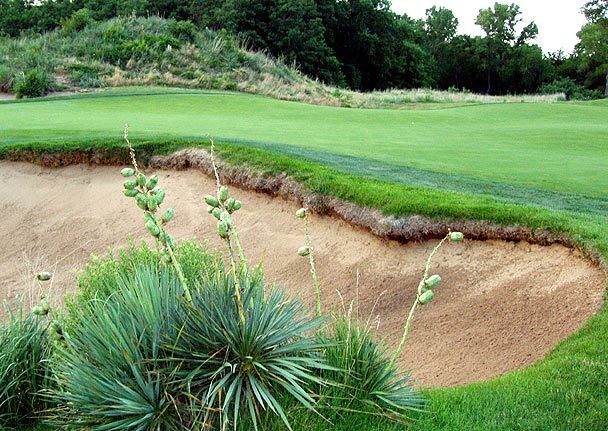 Prairie Dunes will be hosting the 2006 Senior Men's Open. Really, I'm only experienced with *miniature* golf ("the sport of kings", I always say to anyone I'm trying to con into going with me), but the terrain out here is beautifully prairie and "duney". Hutchinson is, of course, trying to spiff-up for the tournament. 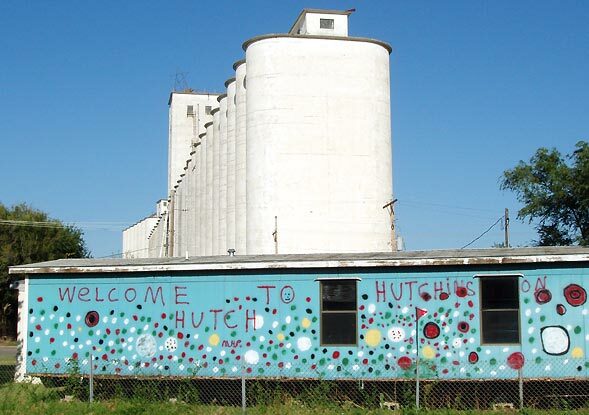 Right along Kansas Highway 61 in Hutchinson you can see this trailer, festively decorated to greet visitors. I like it. I really do; I'm not being sarcastic. I wonder of the city told this guy he had to paint his trailer and so, well, he did. Who doesn't like bunnies? Bad people, thats who. 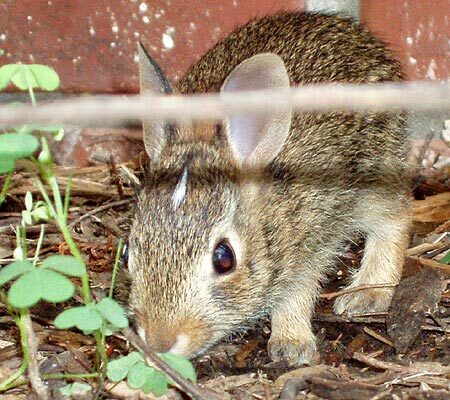 Here's a baby one underneath a hedge in Joplin, MO. 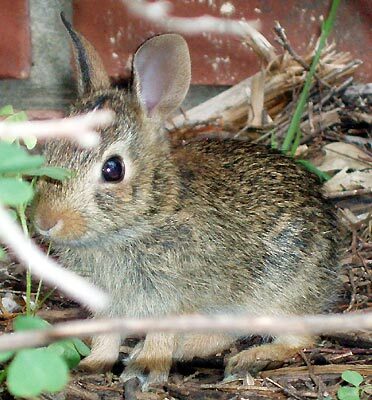 This is the common variation, without antlers. And finally, we leave you with a pretty road cut, just because we like all of you. This along Kansas Highway 400, near a rest stop just east of Beaumont. The cat tails are blooming now and I've always enjoyed this particular patch of erosion so it seemed the time to shoot it. We had a fine mid-summers day and hope you did, too. Here's to hoping the summer treats most of us well. 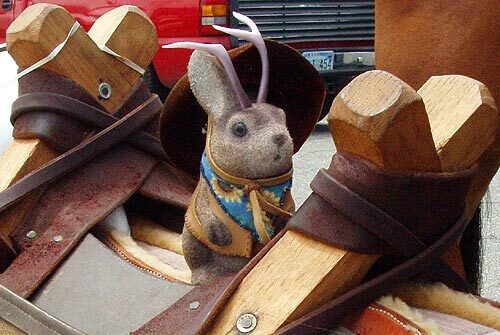 Ace, honey, you know I love you... you're my all time favorite Jackalope and Travelling Companion, but sometimes your ADHD gets the best of you! Great pics as always, and an interesting post to be sure... I'm a little overwhelmed but the number and variety of topics you covered in this one!!! oopsie! I meant overwhelmed BY, not overwhelmed BUT!! !